During the long winter months in Northern Europe, car companies eager to show off their new products usually take journalists off in search of some sun--the South of France, southern Spain or the Portuguese Algarve are favorites. That's not the Volvo way. The Swedes like to show what their cars can do in the most inhospitable of climates--usually as close to the Arctic Circle as they can get. Winter testing with Volvo has become legendary and this year the destination was Ivalo in Northern Finland just a few kilometers short of the Russian border. There has been the odd mishap in the past, and it usually happens to the Brits. One year, for example, the temperatures clipped so low that the hydraulics on the aircraft due to fly them back froze--even worse, so did the alcohol on-board. A couple of years ago, the huge tepee-style tent pitched in the middle of a snowfield in which the Brits were dining caught fire sending them scattering in all directions--still it warmed things up for a while. So, apart from snowmobiles and toboggans, what was the point of this exercise? It was to put the new Volvo V50 and XC90 V-8 SUV through their paces on demanding, ice-covered roads and slaloming across frozen lakes. A couple of XC90s got ditched on the off-road course (and had to be towed out by a Mitsubishi), but at the cost of no damage to vehicles or occupants. That gap is now covered. About 75 percent of all V-8 models, of which 15,000 a year will be built, will head across the Atlantic. While most of the attraction behind the new Volvo XC90 V-8 lies in the powertrain, that is to say the engine in combination with a compact new 6-speed automatic transmission, what is notable is the world's first system for all-wheel-drive with Instant Traction, which gives enhanced grip on poor surfaces. Meanwhile, the V50 plays an important role in Volvo Cars' strategy to rejuvenate its brand image by appealing to parents in the 30 to 40 age range. The aim is to sell more than 70,000 ears a year, mainly in Europe. 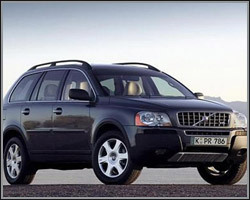 Germany is expected to be the largest market with an average of more than 12,000 Volvo V50s a year. The V50 has transverse in-line engines in both 5-cylinder and four-cylinder guise. "Fitting a five-cylinder engine into a compact body is an advanced science," says Peter Ewerstrand, project manager for the V50. "We have succeeded thanks to new methods of shrinking the engine's outer dimensions." The top model in the Volvo V50 range is the four-wheel-drive turbocharged T5 AWD, which has a five-cylinder 2.5L gasoline engine and a four-wheel-drive system similar to that found on Volvo's larger AWD models, with a fast-responding, electrically controlled hydraulic clutch (Haldex) that contributes to consistent and reassuring road manners on all types of road surface. The six-speed manual gearbox, that was originally developed for Volvo's advanced R-models, is also available on the Volvo V50 T5 AWD and adds still further to the sporty appeal. The traction systems on both the SUV and the V50 are impressive. Even on the slipperiest of surfaces, particularly the frozen lake slalom courses, you rely had to work hard to get into trouble. As soon as grip is lost, power is automatically reduced and distributed to those wheels that can get a grip, reducing under- and over-steer down to the levels that even the most inexperienced of drivers can manage.